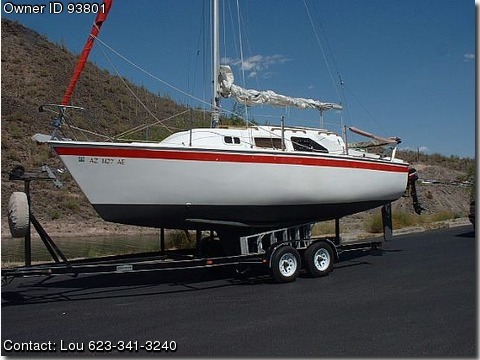 Call Boat owner Lou 623-341-3240. Anchor 200ft rode, bilge pump, cover, coast guard pack, compass, depthfinder, fishfinder, gps, cabin 6ft2 headroom, icebox, porta potty, stove, micro, 2 axle trailer with tongue, 2 batteries 12v, vhf radio, sleeps 5, 20 gal fresh water tank, 6 gal gas tank, closet v berth cabin, furling head sail. Furling headsail, sail covers, life vests. All new halyards and jib sheets. Solar charger, dual 12v group 24 batteries. Danforth anchor with 200 ft. rode. Bulkhead compass, Eagle Cuda 240 depth gauge, gps, fishfinder. 20 gals fresh water tank with electric faucet. Gas stove, sink, ice box. 6'2" headroom in main cabin. Head (porta-potty) and closet in v berth cabin. Zieman split axle trailer with 8 ft. tongue extension.